Adham Schirg is Fairbanks School District’s pick for its new superintendent. After a public meet and greet for each of the three finalists and a lengthy executive session were held Tuesday night, the Fairbanks Board of Education selected Schirg to be its superintendent to replace Bob Humble. 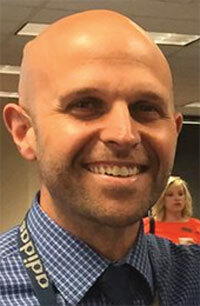 Schirg, of Sunbury, has been the principal of Phoenix Middle School and Worthington Academy since 2015. Lippencott said each candidate also had great reference checks and were “high energy,” but he had the highest energy of the other two candidates. The board president said K-12 Consulting Inc., the firm the district hired to assist with its superintendent search, has been authorized to negotiate a contract with Schirg. This will include his contract duration and salary. He said the district hopes to sign contracts with Schirg before Feb. 12 at a special meeting. Lippencott said there was a lot of positive feedback from the 34 people who participated in the meet and greet. He said the public’s feedback was taken into consideration when the board named its choice for superintendent. The decision to name Schirg was made Tuesday night once the board of education left executive session. The Journal-Tribune tried calling for the name of the superintendent, but no one could be reached before press time Wednesday. Lippencott said he wanted to share the information with Fairbanks staff before making the official announcement. “We had talked to all three candidates and we had shared the information with our staff,” he said. The board president said the board will welcome Schirg and his family with a reception, planned to be held at the next board of education meeting. The next meeting will be held at 7 p.m. Feb. 25.